SARpy allows you to develop a model to classify chemicals according to a given property, such as carcinogenicity or fish toxicity. SARpy breaks the chemical structures of the compounds in the training set into fragments of a desired size, and it identifies fragments related to the target property. It then also shows the fragments related to the effect. Inhibiting conditions are identified which prevent the appearance of the effect, even in presence of the active fragment. The system uses SMILES in the canonical form. It allows choice in building more conservative or more accurate models. Allows you to develop a model to predict continuous values for properties such as carcinogenicity and fish toxicity. CORAL breaks the chemical structures of the compounds in the training set into small components (SMILES attributes), based on the SMILES structure in the canonical form. The set of compounds are split into a subtraining set, a calibration set and a test set, in order to avoid overtraining. The inclusion of parameters such as the number of epochs, and rare SMILES attributes, enables the optimisation of the model. A collection of tools for chemoinformatics. 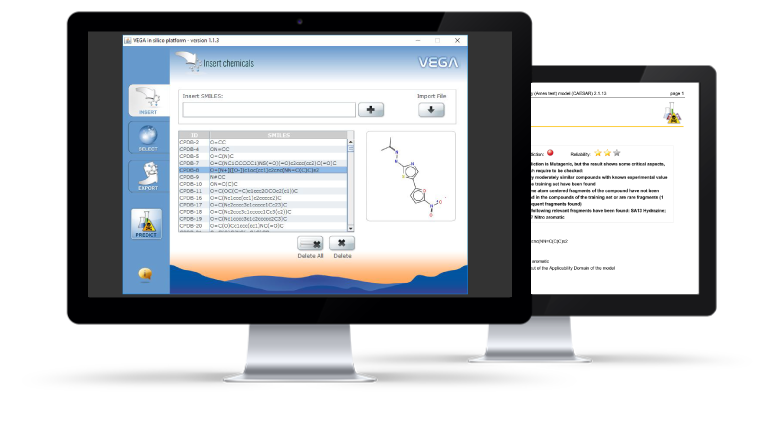 These software use the features developed inside the VEGA application core libraries, like molecule conversion, manipulation, SMARTS matching, similarity calculation. VEGA-based tools has been developed by Kode s.r.l. in collaboration with Istituto Mario Negri. The In-Silico Tools are freely available for download, upon registration, at Kode website. For the modelling, the user provides descriptor values and target/endpoint values as input for the program.